Published on 6 July 2010. Twelve months ago, I was ‘a PC’, as the ads would have it. I’d used Windows for most of my computing life, and had no real reason to change. To me, Macs were incompatible with everything I use, great for graphic design and little else, and owned only by pretentious idiots with more money than technological sense. Now, I have a MacBook Pro and and iPhone. So what changed? How did Ballmer lose his grip on me in the face of the cult of Jobs? Well, I came to the dawning realisation that Apple products are better for my needs. My old Toshiba laptop was happily running along on Windows XP, but nearing the end of its lifespan. After four years of abuse, it was running slowly, becoming occasionally tempremental, and making worrying noises now and again. I decided it was time for a new one. At the same time, I’d be trying to find the perfect operating system for my Acer Netbook. It came with a fairly rubbish pre-installed flavour of Linux, and I’d been experimenting with Ubuntu, Moblin, even Windows 7 (which ran so slowly it was comical). I had come to realise that operating systems could be done better than Windows – though I wasn’t sure I was ready to leap to Linux for the purposes of my main computer system. One of the most negative aspects of my experience with Windows XP on the laptop was it’s constant nagging. Everytime I opened the lid of the laptop, it would have a handful of messages to tell me it had connected to a wireless network, updated its virus scanner, and an update or six were available – which would probably require a reboot taking at least ten minutes. My limited experience of Windows 7 on other computers and on my netbook hardly convinced me that Microsoft had reversed this trend. What I needed, I realised, was an operating system that gets the hell out of my way, and just lets me do what I want to do – much like Moblin on the netbook. Now around this time, many of my online acquantances were changing to MacBooks. I was mildly curious about this, but I was fairly sure that Mac wasn’t for me. I didn’t want the hassle of converting documents to use them on Windows machines, having to find alternatives to the software I use that are ‘Mac Compatabile’, and peripherals probably wouldn’t work with it either. No, I was sure I wanted to stick to Windows. Then, with curious timing, an Apple Store opened near me. Being a bit of a tech-head, of course I naturally went to have a look. Initially, I gawped from outside at the hoards of people, wondering how people could spend so much money on such ‘toys’ instead of proper computers. Within a couple of weeks, I ventured inside. 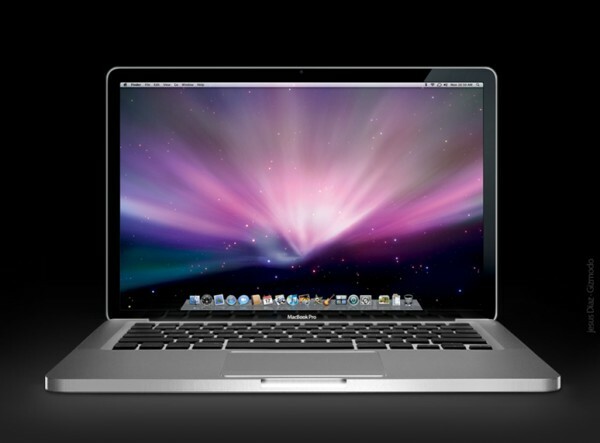 Having never really examined one in the ‘flesh’ before, I was amazed by the MacBook Pro. It was a thing of beauty. It wasn’t a noisy great hulking grey plastic lump of ‘tech’ like my laptop. It was metal, and shiny, and sleek. It looked like it had been designed, rather than just being the result of an unholy union between screen and keyboard. It impressed. And, over time, the seed planted by the Apple Store grew. I learned that that right-clicking was not only possible, but easy – just click with two fingers. I noticed how the Macs sped along, even when multitasking, compared to my slow, clunking laptop. And gestures like two-fingered scrolling and four-fingers for exposé came naturally, even from just playing in the shop. More than anything, the more I learned about Mac OSX, the more I felt some design had gone into that too. It didn’t feel like the latest iteration of something that had gone on forever. It felt thought-through, somehow fluid, and complete. It just worked, and kept the hell out of the way. I was given yet more confidence to make the switch by the support offered by the Apple Store. The idea that they were there, on hand, to help with any questions or struggles I had was manifestly reassuring. And the idea of being able to take a misbehaving laptop straight to the Genius Bar for repair sold me too. So, after a little research, I took the plunge. I made a Personal Shopping appointment, took along my NHS ID and got a hefty discount off a new MacBook Pro. The shopping experience itself was brilliant. I had an attentive assistant’s undivided attention, and he was clearly knowledgable. He knew all about the machines, how they worked, and how to do stuff on them. He didn’t try to up-sell – despite me expecting him to, when I asked if the 13″ would meet all of my needs. Ask that in PC World, and they’ll undoubtedly try to sell something horrendously overpowered to bulk up the sales figures. The guy was trying to tell me all about the benefits of iLife – I wasn’t really interested, I assumed this was Apple’s version of bloatware that I’d remove within days. He offered to take in my old laptop and transfer everything across, but I figured that I could do that myself – though he assured me that they’d be there if I got stuck. I got the MacBook home, and loved it. Transferring everything across was easy, especially as most of my documents and the like are stored with DropBox. Transferring music involved a simple iTunes backup on the old computer, and restore on the new one. Easy. The ‘bloatware’ of iLife turned out to be excellent. I use Mail, Address Book, Calendar, iPhoto, and iMovie regularly, and GarageBand for podcasting. Everything stays in sync with my Google services flawlessly – I now rarely find myself logging in to the Google Apps online. I was initially frustrated by the lack of a “maximise” button on the Mac, but once you’re used to working in windows that are only as big as they need to be, you quickly learn to appreciate the advatanges of working in multiple windows. As I write this, I have a couple of chats window open on the right of the screen – something I never would have done under Windows XP as I would naturally have maximised this one window. I’ve also adopted this new-found multitasking behaviour on the Windows systems at work – and often try to stroke the mouse, as I do my Magic Mouse at home! Whilst I have iWork on the MacBook, I also bought Office for Mac for pennies via NHS Discount, and find myself using that instead. Again, the layout of the software is rather different to what I’m used to under Windows, but it is in many ways more intuitive through being less formal and more fluid. Writing a PowerPoint presentation a few weeks ago seemed easier on Office for Mac than on regular Office – even though it’s regular Office that I’m used to. And I had no problem at all loading it onto a memory stick and presenting it at work. MacOSX does what I wanted – stays out of the way. And I’ve come to appreciate that features like exposé, which look like flashy gimmicks in the shop, are invaluable – I actually don’t know how I managed without it! And I can honestly say that I haven’t found anything – anything – that I could do on the PC but can’t do on the Mac. So, laptop wise, I’m a Mac Convert. I prefer the way Macs work, look, and feel. They are a better match for me than Windows PCs – though I accept that some will prefer the latter – I’m a convert, not a cult member. I was going to write about how I was later converted from Blackberry to iPhone, too, but given the length of this post, I think that will just have to wait till another day. This 1,420th post was filed under: Reviews, Technology, Apple, iLife, Linux, MacBook Pro, Microsoft, Moblin, Retail, Ubuntu, Windows. Comment posted at 12:21 on 7th July 2010. Mmm. I’m a reluctant convert too, kinda. Always been a PC power user, but had to get a Mac to cope with some serious video editing. Now I barely use my (big, beautiful, powerful, home-built) PC – games and 3DSMax, that’s about it. But I HATE Macs. Dammit. Funny that all the niggles I had with Mac OS do seem to pale into insignificance in this wonderfully peaceful nag-free world, though. You’ve put your finger on something I hadn’t noticed until now – Windows is constantly nagging you, telling you stuff, keeping you updated about the computer, when you’ve really sat down to try and do a higher-level task. Comment posted at 07:03 on 9th July 2010. I really like your description of Macs being more “transparent” to the task you’re working on – that’s exactly what I was trying to get across! Trackback received at 08:07 on 9th July 2010.